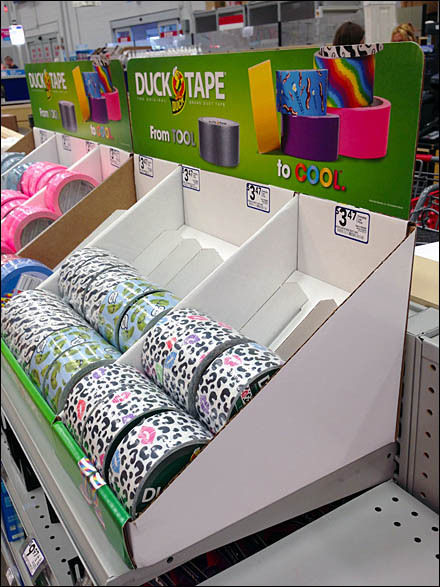 Not only is this temporary point-of-purchase display gravity feed, it employs a radically steep angle to keep designer rolls of tape well forward and dramatically presented … Duct Tape On a Downhill Roll. Corrugated lane dividers reinforce the regime and foster a well-ordered look. 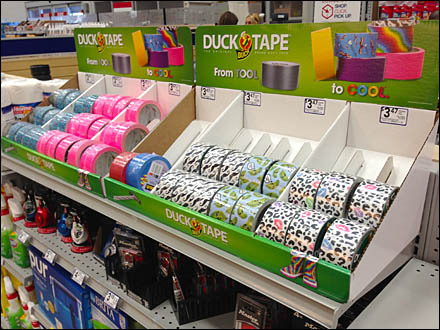 A lengthy corrugated branded Masthead spans several units to command more attention than each could do singly. See the Duct Tape On a Downhill Roll thumbnail for more of a front view.